Cosy Studio of about 45 square meters, recently renovated and decorated with elegance, Ideal for 2-4 persons, this apartment is situated on the first floor (one flight of stairs)and includes a small balcony. The entrance door gives on the spacious living and dining room with fully equipped kitchen (i.e. : Dish washer, washing machine, toaster, koffee machine, oven). The living area includes a comfortable double sofa bed. The bedroom contains a double bed, besides there is a nice bathroom with shower. Very close to Siena, with a good bus service towars and from the city centre. it is the ideal place for all those who would like to discover this beautiful medieval city as well as the gorgeous surrounding area. Absolutely perfect home in a perfect location! What a surprise to find such a gem in the heart of Italy. The apartment could not have been more perfect for us. There is such a homey feel and the owner was always friendly and eager to answer questions we had about the area. The apartment had everything we needed and more. We had a wonderful countryside vew from our bedroom window and the local bakery greeted us each morning with the delightful aroma of fresh baked pastries. It is very modern with wi fi, dishwasher and even a washing machine. Thank you so very much for sharing your home, we did not want to leave! Thank you Diane, it was very nice meeting you both! "If you have a car (renting GPS is a must for getting around Siena and the hill towns) for exploring the Siena and Tuscany area, this is an excellent location. Parking is available, and the apartment is situated to the west of Siena which allows for easy getaway for exploring the wine country and the hill towns. For exploring Siena, there is free parking near the soccer stadium just outside the old town walls. The apartment is nicely decorated, homey, clean, and safe. 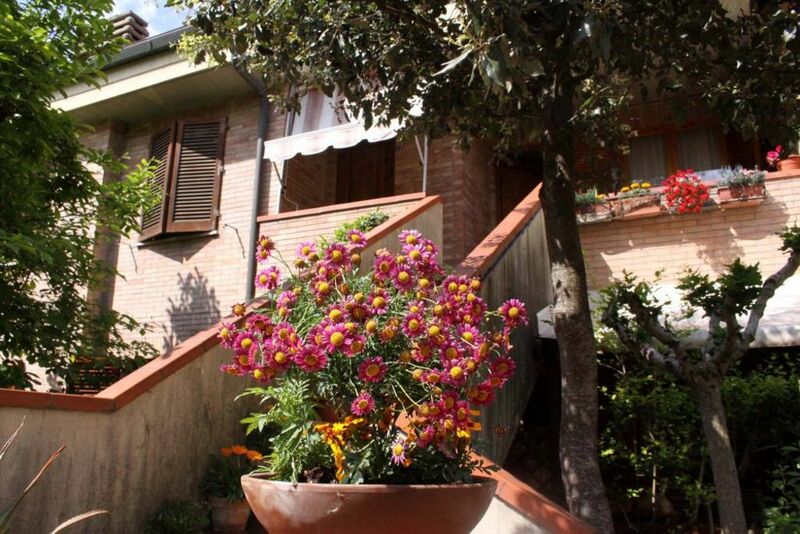 It is situated in a middle class Sienese neighborhood. There is an excellent and well stocked supermarket just a five minute drive to the small neighboring town of San Rocco di Pilli (Coop). The apartment has all utensils necessary for cooking, has its own hot water heater making hot water available upon demand (sometimes rare in Italy), and a full sized bedroom with normal sized bathroom with shower enclosure. The apartment is about a two -hundred foot walk from the parking lot, and the apartment is up a flight of about 15 stairs—if this is a problem. There is a wonderful bakery and a smaller neighborhood grocery within 200 feet of the apartment. The apartment is managed by a husband and wife, who live next door. We found the couple very helpful and nice. The wife is fluent in English and well versed on arts and history both of Siena and the surrounding hill towns. If you have a car, I would recommend this place highly. When we return to Tuscany, we will stay here again. A good choice allowing flexibility and independence, while also providing value for dollar spent." Vielen Dank und liebe Gruesse! Nous avons été très bien accueillis par Marzia qui nous a bien conseillé pour les visites et les commodités à proximité. Elle est disponible tout en étant discrète. Le logement est très bien équipé dans un quartier calme. Il est très bien situé pour visiter Sienne et sa région. Nous recommandons cette adresse. Appartement propre et bien équipé seul bémol ; On entend bien les voisins la climatisation serait appréciable ....mais une pâtisserie délicieuse a deux pas . Coming on the motorway from Florence, take the exit SIENA OVEST, PORTA SAN MARCO and turn left towards MASSA MARITTIMA, SS73, SENESE-ARETINA. Be careful not to turn either left towards Arezzo-Grosseto or right towards the city centre. Carry on straight on along the SS73 passing the hamlet of Costafabbri until Costalpino. Here turn left at the second turning by the bar and the post office. The house is situated just behind the pastry shop, in 20 via Dario Neri. A good pastry shop just nearby, as well as a post office and a cash dispenser. A good restaurant and a pharmacy are just 100 meters walk. Siena's city centre is 3 km away and it can easily be reached by bus (about 10 minutes away). tarif en fonction du nombre de personnes, acompte/arrhes de 30% du loyer à la réservation, remise des clés par le propriétaire.